Whether you spend a lot of time in your wheelchair or just use it for traveling long distances, accessories can help make life more convenient and help maintain your independence. A tray is a versatile feature that is a worthwhile investment. Our Best Wheelchair Trays review identifies quality, affordable products that are sure to make your life easier. The generous surface area makes it worth a look. 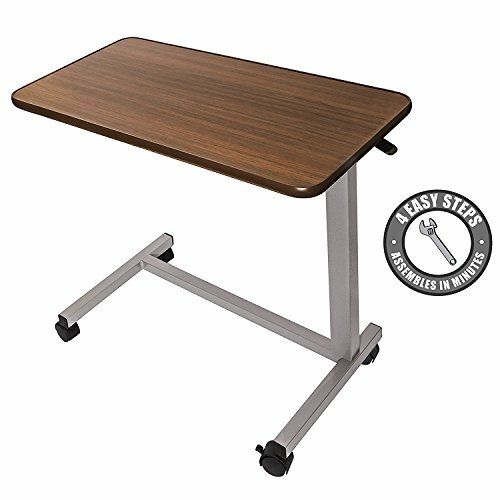 The Vaunn Medical Adjustable Overbed Bedside Table has a walnut-grain finish that is easy to clean. It provides a roomy surface for everything from eating lunch to working the daily crossword puzzle.. It is adjustable – extending 28 to 40 inches high. It won’t attach to your chair, so you can’t take it with you. But it’s a sturdy at home option that can be used while you’re in a wheelchair, a recliner or the bed. This tray resists stains for easy clean up. The Essential Medical Supply Deluxe Rosewood Tray is made of a dark-grained finish that won’t show stains. It attaches to the arm of your wheelchair by hook and loop straps. It is a good size with plenty of room. We liked the attention to detail like the raised lip on the edge. It’s easy to clean which is another bonus. This simple yet practical tray is lightweight. CLEAR WHEELCHAIR TRAY WITH CONTOURED semi-circle cutout significantly increases your wheelchair's functionality. CONVENIENT HOOK AND LOOP STRAPS secure the tray around the wheelchair armrests. WHEELCHAIR TRAY fits most standard wheelchairs, measures 23 by 19 by 1/4 inches. PLUS, it's very easy to clean. The DMI Clear Wheelchair Tray has a raised lip along the edge with an extra piece at the top of the product which keeps your items in place. It’s meant for standard-sized wheelchairs and may not work with powered ones, depending on the design and features. This comfortable walking cane and seat is especially comfortable due to its large seat and comfort grip handles. 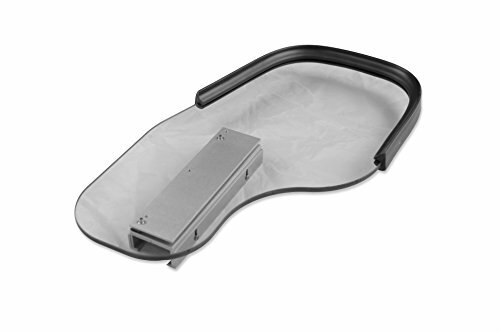 The Rehabilitation Advantage Polycarbonate Wheelchair Half Tray has a large rubber lip around the front half of the item that will ensure nothing falls off. The back of the tray lacks this feature. The product is made of polycarbonate and won’t break. It slides onto the armrest, so there are no straps or hooks to keep it in place. Though some may find it too small, it is a quality product. The Comfort Company EZ Tray comes with three poles that give it a broad height range extending from 7 to 30 inches. It clamps onto the frame of your wheelchair and fits securely in place. It can be swiveled out of the way when not in use. The most important factor is being able to use the tray with your existing wheelchair. Look for words like universal or adjustable in the product description. That’ll give you a reasonable expectation about how it will work for you. You’ll find that many trays will work with just about any wheelchair. The exceptions are non-standard manual chairs or powered ones. We suggest reviewing the dimensions before you buy to make sure it’ll fit for your situation. The freestanding trays offer a reasonable alternative, especially if they have a decent adjustment range. These types use clamps to secure them in place. These are usually universal in size, making the fit a non-issue. The only remaining concern rests with whether it affects the use of your wheelchair. 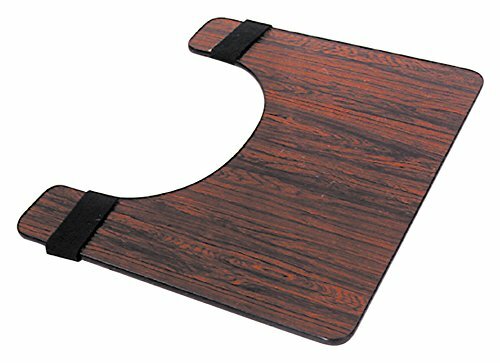 The best wheelchair trays are simple to put on and take off without any hassles or special tools. Chances are you won’t use it all the time, so you or your caregiver must be able to remove it without difficulty. We prefer products where this feature is intuitive. You’ll see products that attach directly to the armrests whether they slip over them or rely on straps or hooks to secure them. We prefer the former since they tend to offer a more stable surface than the latter. Pay attention to the width of the tray to make sure the arms will sit along the entire length of the armrests or at least most of it to prevent tipping. That also applies to the ease of cleaning it. We like products with a finish that can handle regular use without chipping or cracking. Dishwasher-safe ones offer an even better way to ensure that you can clean them thoroughly. When it comes to quality, you do get what you pay for. It’s no different with a wheelchair tray. We suggest finding out the weight capacity of the product along with its materials. That’ll give you a good indication of its lifespan. We prefer items with a laminated surface that will help with clean-up and also protect the tray from getting chipped or scratched. Just like a cutting board, dings provide places for bacteria to accumulate. You’ll see trays in a wide range of materials from acrylic to wood to polycarbonate. All will serve their function adequately as long as they are well-made. has Acrylic tables have the advantage of being lightweight which is worth noting if you’re going to be setting up and taking down the tray. A wood table offers durability and is often a more attractive option. On the downside, wood is heavy and can be difficult to lift and maneuver. Polycarbonate tables provide the best of both worlds with a product that is, for all practical purposes, unbreakable yet lightweight. How comfortable a tray is often falls into the deal breaker/dealmaker categories. When it’s in place, you will likely use it for long periods of time. Rounded edges and an ergonomic design go a long way toward making it a wise investment. Most items have a raised lip around the edge of it to keep things from rolling off the surface. We suggest sticking with products that have this feature along the entire perimeter. However, there is still that fine line between practicality and comfort. It shouldn’t hurt to rest your forearms on it. Make sure whatever product you choose has a satisfaction guarantee and preferably a warranty too. Buying online is convenient, but it doesn’t beat trying out a tray for a few days to see if it’s the right choice. Compared to some accessories, a wheelchair tray isn’t expensive, though you will see a range of prices. After all, the wheelchair itself can run anywhere from under $200 to several thousand dollars. Trays vary in cost too, depending on the construction, materials, and other features. Standard items that fit on the armrests are an economical choice usually. However, depending on the weight of the tray, it may mean having someone else install and remove the tray for you which may affect its usefulness. Standalone models offer the convenience of being able to move them aside easily when you’re done with them. They may have additional features too like a cup holder. But they usually cost more than other trays. 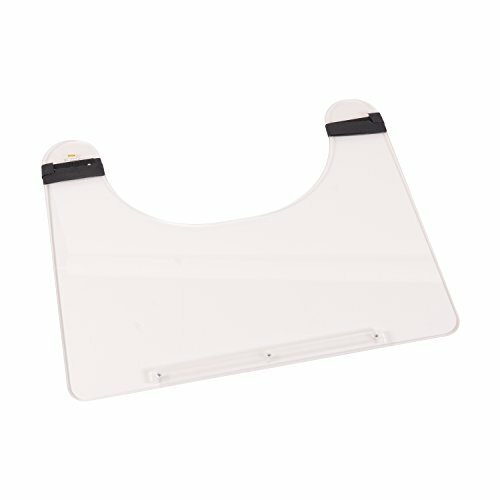 The best wheelchair trays are those that are easy to use while providing a comfortable surface for your arms and hands. They offer value at a decent price and will last. We recommend considering how you will use it and what features matter most to you. Its purpose, after all, is to make your life simpler and help you maintain your independence with daily tasks.